COMING DOWN. Jim Osterman recently returned from a 20,000 mile motorcycle trip where he skydived to raise awareness of veteran suicide. Jim Osterman is fearless. He’s the kind of guy you see riding a Harley Davidson in a thunderstorm because he just doesn’t care. How do I know this? Because that’s exactly how he showed up to the coffee shop when we met each other earlier this month. He was wet from head to toe and his cell phone was waterlogged, but he sure was happy to be there. A few days prior, Jim, a U.S. Navy veteran, had returned to the Chippewa Valley from a trip that surely touched the lives of many individuals. On May 23, using more than 500 hours of personal leave and PTO saved up from 18 years working as a maintenance technician, Jim set off on a 67-day solo motorcycle trip across the U.S. He left with a mission: to raise awareness of veteran suicides and to offer support and camaraderie to those in need. According to the Department of Veterans Affairs, an average of 20 veterans commit suicide each day in the United States. Jim knew this information to be both true and troubling. He’d had multiple close veteran friends who had taken their own lives. In addition, Jim nearly succumbed to his own feelings of isolation in the late ’90s. In response to these tribulations, Jim knew that something had to be done. He created a Facebook page – soon to be a 501(c)(3) – called “Veterans Skydive for Life” and began planning his ambitious journey. 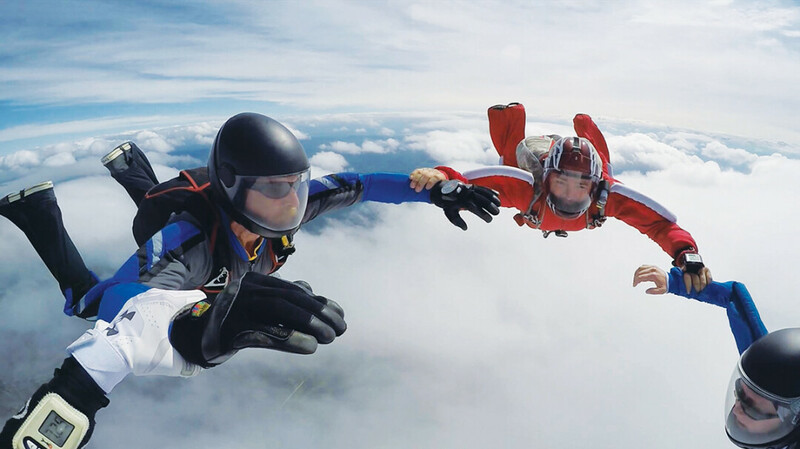 He would visit different skydiving drop zones and invite local veterans to spend time together and, if they were up for it, skydive together. True to his word, he certainly did something about it. Thanks to donations from friends, family, and groups such as Vets Fighting for Vets and Road to Freedom, Jim was able to cover more than 20,000 miles on his Harley, ride through 27 states, visit 56 drop zones, and socialize and jump with hundreds of veterans. Sure, it sounds like the trip of a lifetime, but it wasn’t all smooth sailing. Jim managed to run into not one, but two tornados (courtesy of Kansas and Kentucky). He was nearly killed by a semi during a flash flood in West Virginia, he dropped some very valuable camera equipment from the sky in Arkansas, and he lost a phone at one point or another. Did Jim keep going despite these things? You bet your gosh darn boots he did. And he isn’t stopping. Jim envisions planning a weekend escape for those local communities – veterans and non-veterans, family and friends – that includes things like camping, kayaking, slack lining, rappelling, and of course, jumping out of airplanes. “I don’t want to have another day. It’s not a day. We have Veteran’s Day and everybody gets all giddy about Veteran’s Day, and then they forget about it. You turn around and you pull the flag down the next day. So what’s your purpose? That bothers me ... If it ends just like that, what was the purpose? We have to keep it going,” Jim said. Jim is currently working with his editor to create a film (set to release this fall) that illustrates the impact of his trip as well as the importance of suicide prevention for our veterans. With over 10,000 photos and 100 gigabytes of video footage from the ride, it’s bound to entertain and enlighten. If you just can’t wait to learn more or would like to send some words of encouragement or thanks his way, you can reach out to Jim through Facebook, catch him coaching skydiving at Skydive Wissota. Or … if the weather’s just right and conditions are anything but optimal, you can catch him on his Harley with a smile on his face.